Twilight last night was fantastically clear and the forecast was good so I set up my 80mm refractor. Took me quite a while since I hadn’t set up my deep sky kit since May.Was a bit slow to polar align and took quite a while to get Autoguider set up. So, it was with some dismay I saw the clouds come in. I got one 2 minute sub of the open cluster M52 in Cassiopeia and beside it, the beautiful, fragile bubble nebula, Caldwell 11. This is a bubble of space within a cloud of hydrogen gas. 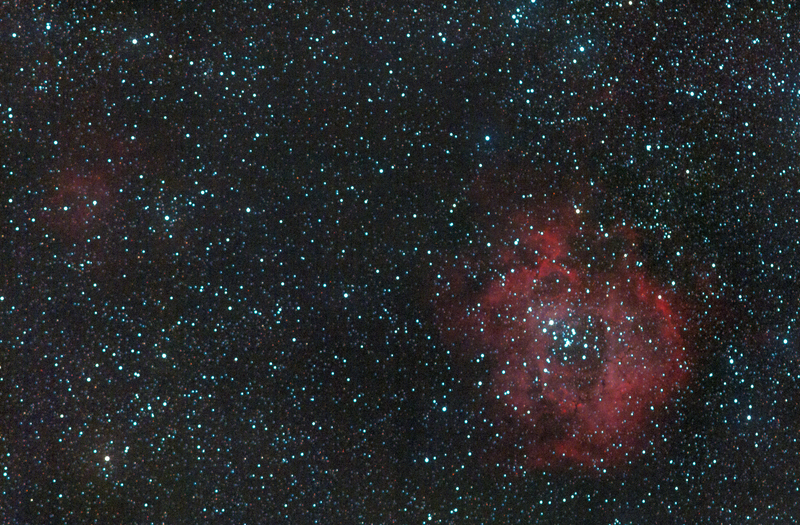 The bubble has been blown by the intense stellar wind coming off a Wolf-Rayet star in the centre. A Wolf-Rayet is a massive star that has blown off its envelope and consists just of a remnant naked stellar core. WRs are so massive that they burn their nuclear fuel quickly to support their weight and have a short stellar lifespan. 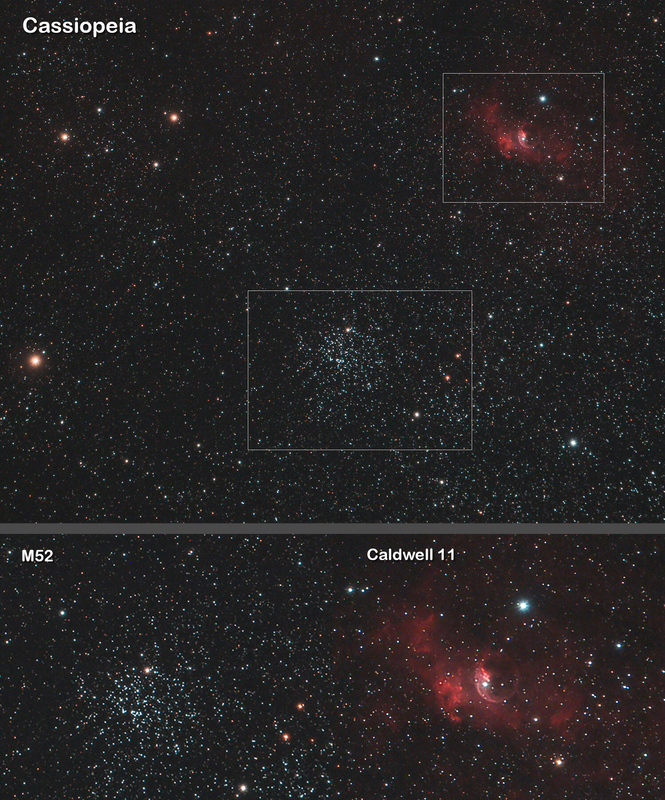 They end their lives as Type 1b or 1c Supernovae. They may also be responsible for some gamma ray bursts as there is no envelope to shield the radiation associated with a core collapse supernova. A direct hit from a gamma ray burst would be, um, very bad for Earth! The surrounding shell of hydrogen gas around this star is excited by the intense radiation of the stellar wind and glows bright red (hydrogen alpha band, 656nm). Look for the edge of the bubble in the red area near top right. 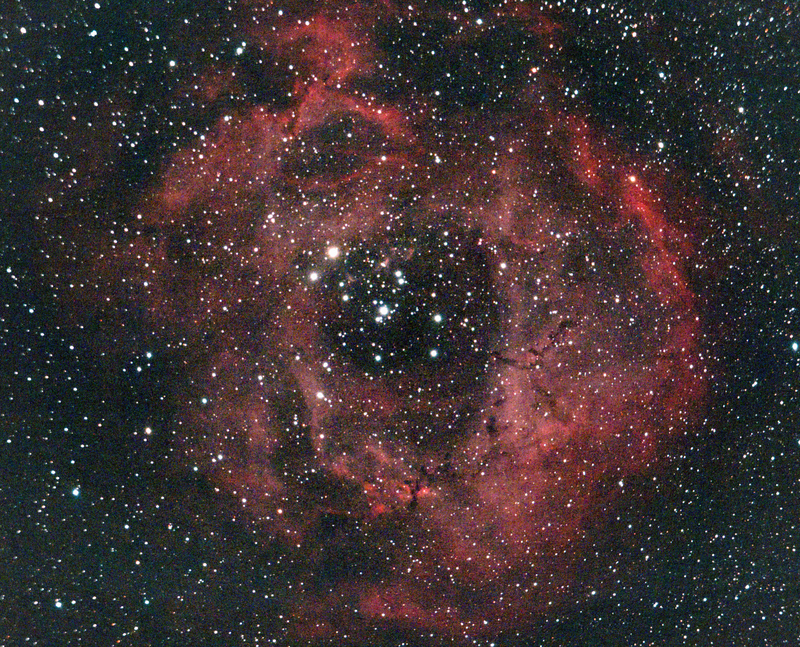 This is my first attempt at attaching my Canon 60Da DSLR to a telescope for deep sky imaging. I was pleased with the sharp focusing centrally but there was quite a lot of coma artefact at the edges which I was able to mostly correct with Photoshop. I was a bit surprised to see so much coma as I have a Planostar field flattener attached to the scope – perhaps I need to put a spacer between the field flattener and the camera. 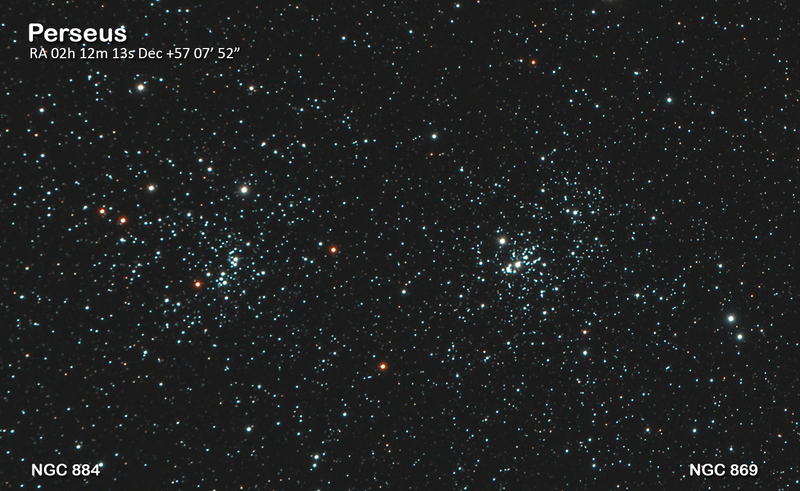 The dark channels (Bok globules) show up quite clearly around the central open cluster. This is an integration of 9 x 60 second and 2 x 120 second exposures with an Altair Astro 480mm f6 refractor and Canon 60Da at ISO 800. This is an attractive HII region surrounding a young, luminous open cluster in Monoceros. 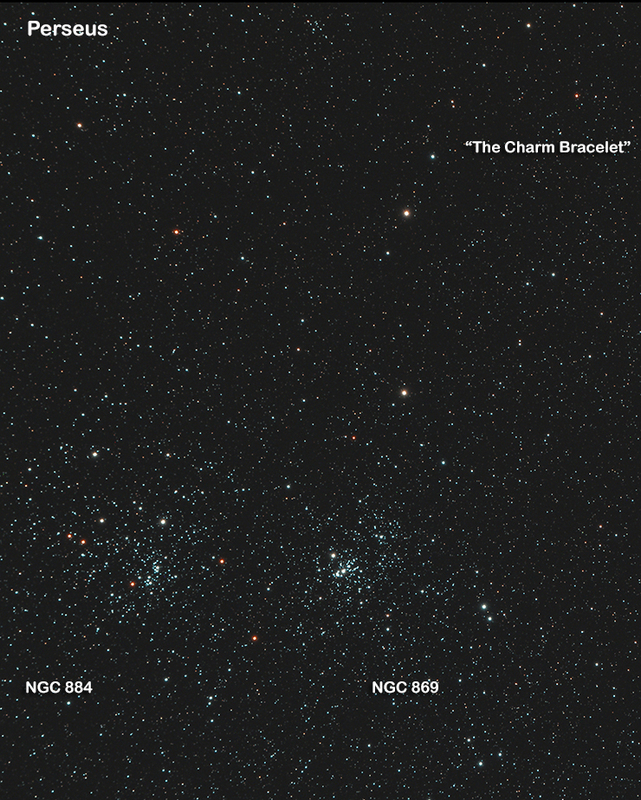 The open cluster is designated NGC 2244, whilst the nebulosity is designated NGC 2237, although some of the subsections have their own NGC numbers. 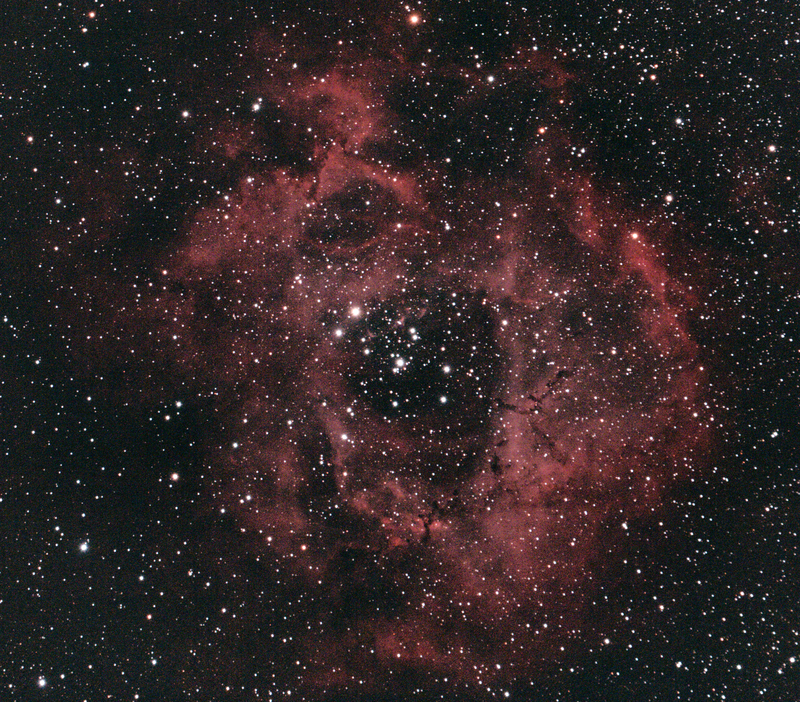 This image was taken with a Canon 60Da (Astronomik CLS-CCD filter) mounted on an Ioptron ZE25GT mount. A 300mm f4 IS L lens was used at f5.6. 15 x 90 second subexposures were combined to give a total exposure length of 22.5 minutes. 20 dark frames were used to subtract thermal noise and library bias and flat frames were also subtracted. 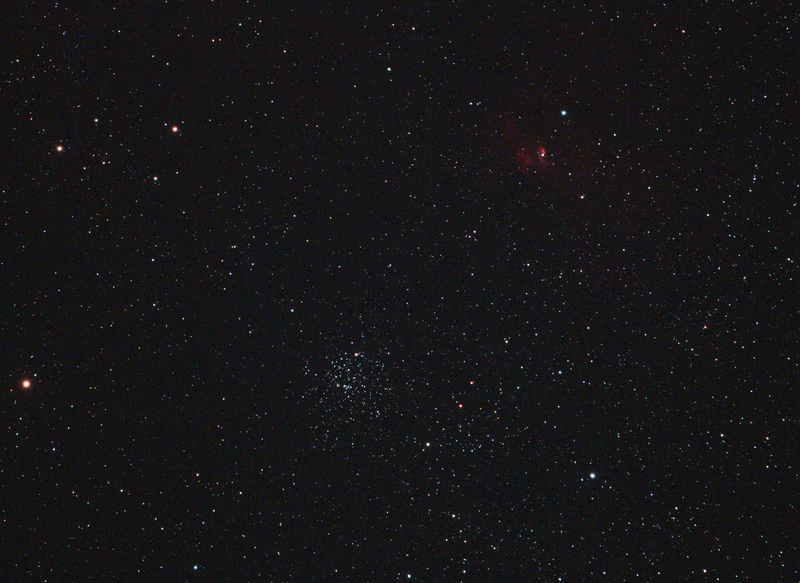 Open clusters NGC 2252, Collinder 107 and Collinder 104 are also visible in the wide angle image. 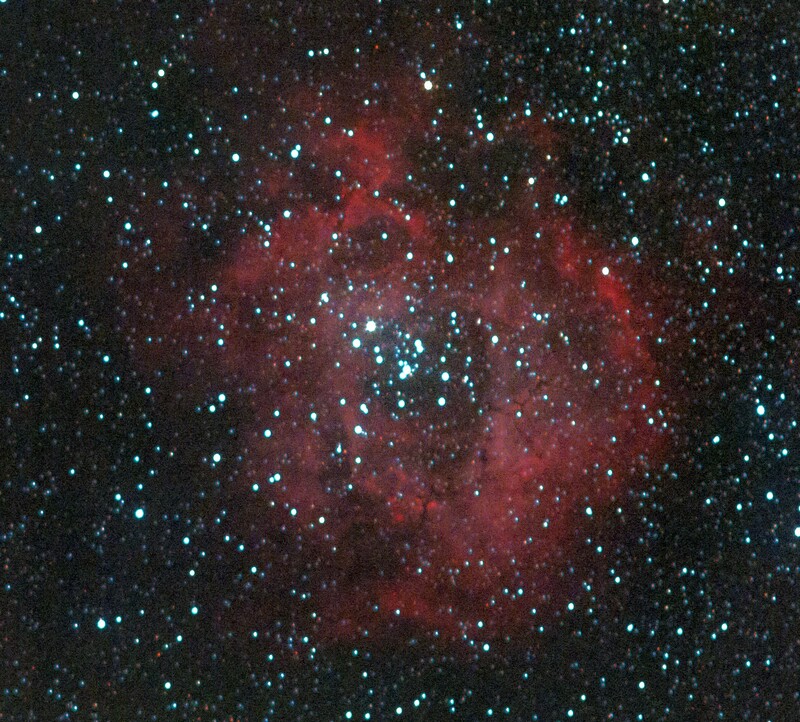 The Rosette nebula (NGC 2237) in Monoceros is a HII region surrounding a central open cluster NGC 2244. Its very difficult to spot the nebulosity in a suburban backyard scope.